I know I promised you wouldn't have to wait long for this next one, but we've been so pleasantly involved in our daily routines that I forgot! We hope you enjoy these photos and videos. It doesn't look like much until you see it with a person in the picture! That's Maya standing below it. Speaking of Maya, here she is, quite pleased with the pigtail braids Emma did for her one morning. Sitting pretty in her costume after trick-or-treating in 28 degree temps! Speaking of halloween...here is the pumpkin Steven carved for us. Surgery training is very useful! 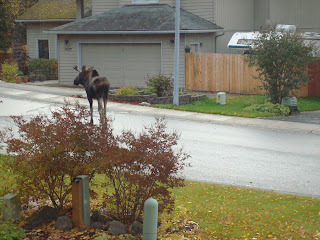 Speaking of pumpkins, we caught the moose nosing around in our neighbor's front yard. We thought he was pawing and nibbling at a bush buried in the snow, but a few minutes later, a snow-covered pumpkin rolled out! He used his front hooves to turn it over and to knock the snow off the surface of the pumpkin. The pumpkin was frozen, so it was not easy eating for the little fella. I guess he got tired after a while and decided it would be easier if he got a little closer! 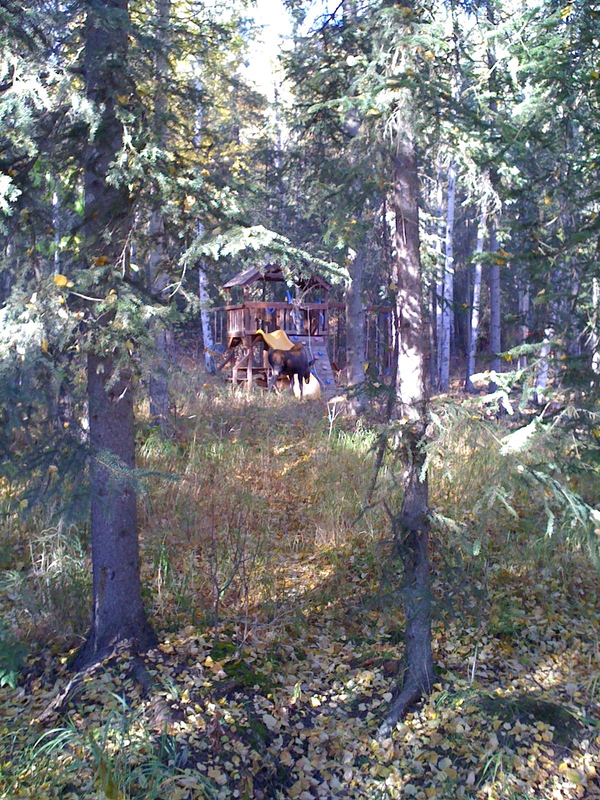 This was one of the first moose-sightings this fall...our neighbor snapped this photo from her window. Was he hoping the girls would come out to play? This young moose is about a year old. He was orphaned last year along with his twin, after their mother was mauled by a bear. A few days later, a young bull wandered through. but he's older, faster, and more wary than the orphan who doesn't seem to mind being photographed or watched. We watched from the front porch as he nibbled on some shrubs... and from the windows as he inspected the snowmen a few days later! Speaking of snow, we had our first snowfall on the last Sunday of September, and even though it was too warm and too brief for anything to stick, it was a thrill to see the white stuff for the first time in 10 years! Above, you see the mountains covered in "termination dust". The first snows collect only at higher elevations and it looks like God took a powdered sugar shaker and gave the peaks a little shake. Termination dust signals the end of an Alaskan summer, hence the name. It wasn't long wait before we had enough snow to play in...this stuff began falling while we were in town for ballet, so we drove home, ate a quick dinner, and suited the girls up for a quick romp before bed. Kyra loved it! Snow angel or grass angel? The days are rapidly getting shorter here. The sun isn't up till after 9, and it only just clears the peak of the mountain as it sails across the sky, warming our home through the windows of our south-facing living room. Here are Maya and Kyra enjoying a tender moment in the sun, dancing together to "Carolina Moon". The late sunrise, and early sunsets are beautiful! In a few more weeks, and we'll only catch a glimpse of it in the morning, and again in the afternoon, but I think that means we'll be able to enjoy the northern lights without staying up too late! Who hast set thy glory above the heavens. Out of the mouth of babes and sucklings hast thou ordained strength because of thine enemies, that thou mightest still the enemy and the avenger. When I consider thy heavens, the work of thy fingers, the moon and the stars, which thou hast ordained; What is man, that thou art mindful of him? and the son of man, that thou visitest him? For thou hast made him a little lower than the angels, and hast crowned him with glory and honour. Thou madest him to have dominion over the works of thy hands; thou hast put all things under his feet: All sheep and oxen, yea, and the beasts of the field; The fowl of the air, and the fish of the sea, and whatsoever passeth through the paths of the seas.